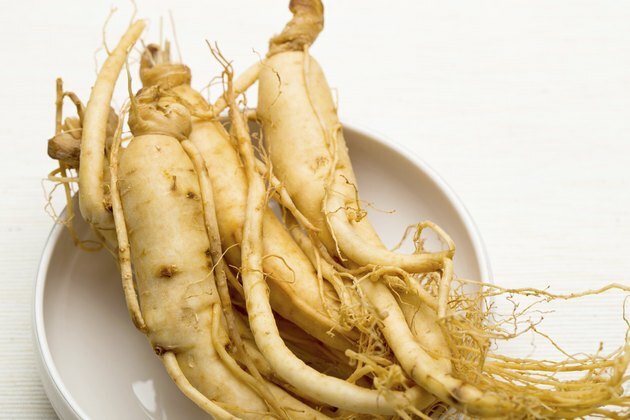 Korean ginseng -- also known as Panax ginseng or Asian ginseng -- has several purported medicinal uses, and people may try it as a weight-loss aid. Korean ginseng, which has different medicinal properties than American ginseng, is used differently in different cultures. In Chinese medicine, it is considered a calming agent. In Western medicine, it is more often used as a stimulant. No matter how it is used, no research to date has proven it to be an effective weight-loss aid. You should not use Korean ginseng without first consulting with your doctor. The reason Korean ginseng may help stimulate weight loss is because it affects the way your body metabolizes carbohydrates, reports Dr. Robert B. Saper and colleagues from Harvard Medical School, in a November 2004 issue of the "American Family Physician." In addition, loss of appetite occurs as a side effect of the herb in some users. However, no scientific studies have proven it to be effective in helping people lose weight. If you want to use it to help you lose weight, first consult with a doctor. Taking Korean ginseng might also offer benefits for people with weight-related disorders. The University of Michigan Health System notes that it might play a role in improving mood in people with diabetes. It might also help regulate insulin levels, improve control over blood sugar and improve energy levels. However, the University of Maryland Medical Center cautions that Asian ginseng might increase blood sugar levels, and its overall effect on blood sugar is not fully understood. Don't take it without your doctors permission, especially if you have diabetes. The most commonly reported adverse effect is difficulty sleeping. Other potential side effects include headaches, dizziness, skin rashes, increased heart rate, changes in blood pressure, mood changes, diarrhea, breast pain, vaginal bleeding and other menstrual problems. In rare cases, the herb has caused liver damage, severe allergic reactions and a severe skin condition known as Stevens-Johnson syndrome. Because of the potential side effects, speak with a doctor before using Korean ginseng so you know what to expect. Only use Korean ginseng for periods of three months or less because of the hormone-related effects that can occur when used over extended periods, MedlinePlus advises. These effects also make it unsuitable for people with hormone-related conditions such as breast, uterine and ovarian cancer; uterine fibroids; and endometriosis. In addition, people with certain medical conditions should avoid the supplement altogether because of potential complications. Because it can affect blood glucose levels, people with diabetes should not take it. And because it affects the immune system, people who have undergone organ transplants or who have the immune system disorders of lupus, multiple sclerosis or rheumatoid arthritis should not take it. The herb also is not safe for people with schizophrenia, bleeding disorders and certain heart conditions. Do not use the supplement without first consulting with a medical professional familiar with your complete medical history.